We primarily operate in the Orlando area, but perform large commercial projects state-wide. This most commonly means large bat control projects, in areas such as Tampa, Clearwater, St. Petersburg, Sarasota, Naples, Miami, Fort Lauderdale, West Palm Beach, Daytona, and Jacksonville. The above two photos of me are typical of the type of commercial wildlife pest control work that I do. 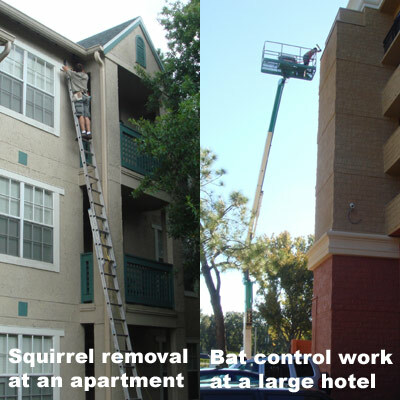 I work on a lot of local Orlando apartment buildings, doing things such as removing squirrels from attics. I also do a lot of bat work, such as the photo of me in a 60' bucket lift doing bat control work at a hotel. If you have a wildlife problem in your building - be it an infestation of rats in the ceiling, or a colony of bats, give us a call with confidence. We have serviced some of the best resorts and hotels in Florida, and dozens of large companies have trusted us to work for them: Sheraton Hotels, Ramada Inns, McDonalds, Wal-Mart, SeaWorld, Disney, Albertsons, Kraft, Hess, Lockheed Martin, to name a few, and dozens of smaller office buildings, churches, and so on. We have the knowledge and equipment to perform the job correctly and legally, and offer a guarantee on our work. I often perform difficult commercial jobs at sites no other company could or would handle - large resorts with barrel tile roofs, 10-story buildings, huge warehouses, and more. The term Florida pest control is not really an accurate term for my industry, nor is Florida extermination. The proper term is nuisance wildlife control operator. However, many people automatically think of pest control when they have a problem with wildlife. The fact of the matter is that most pest control companies like Terminix or Orkin or Middleton handle only insects. They offer monthly or quarterly treatments to spray poison on the property to kill bugs. These companies are not equipped with the tools or knowledge to handle larger animals. Wildlife trapping and removal is all that I do. I do not deal with termite control or the like. I specialize in tasks like removal of a colony of bats from a building, bird control, raccoon trapping and removal, squirrel removal, and so on. Commercial accounts have problems with wildlife just the same as homeowners do, and I'm available to promptly and professionally handle the problem.